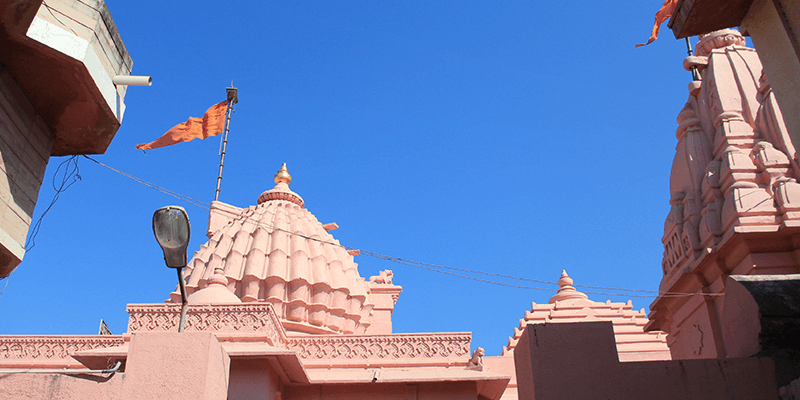 Home Religious Somnath: The Indestructible Temple of India! 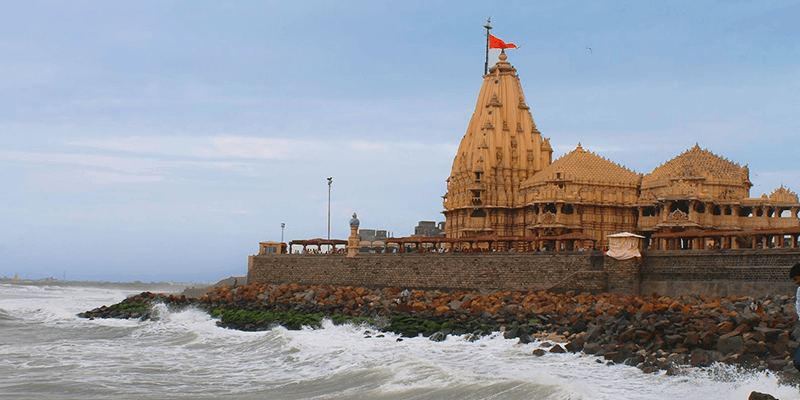 Somnath: The Indestructible Temple of India! It would be apt to describe Somnath temple in Gujarat as “indestructible”. A scribble through the Somnath temple history would tell you that the temple has been destroyed 17 times and each time it has been resurrected! The first temple was built by a Chaulukya king some time before 997 AD. Most of us are under the conception that Mahmud of Ghazni (in 1025–1026) was the first person to destroy and loot this revered Indian temple. But you are up for a surprise in this regard! Some historians believe that Mahmud of Ghazni was responsible for the third major destruction to the temple (and not the first one, as believed by most of us)! The first temple was destroyed by some unknown Arab invader! However, each time the Somnath Mandir has been destroyed, a new temple has come up with more beauty and splendour. The last resurrection of the Somnath temple took place under the command of “Iron Man of India”, Sardar Vallabhai Patel (between 1947 and 1951). The presently existing Somnath Temple (situated in Prabhas Patan near Veraval). Somnath Jyotirlinga is among the twelve sacred Jyotirlingas and millions of pious minded travellers flock to this temple in hopes of paying their reverence to Lord Shiva. So, let us learn more about this wondrous temple. Somnath temple’s design resembles the Chalukya style of architecture. Standing inside this coastal temple, you can actually hear the sounds of the sea waves crashing against the shores! The exterior beauty of the temple is enhanced by a tall spire and flag pole. You can see the dark Saffron flag fluttering in the sea breeze from quite a distance. The main attraction inside the temple is of course the Somnath Jyotirlinga. While we do not know who sculpted this idol, but what we know is that the sculptor was a metallurgical genius! As the story goes, the Shiva Linga is built of a special metal that helps it stay afloat in water! Trivia: A pillar inscription, within the Somnath temple, states that the temple is built upon the first piece of land towards the North from South Pole. 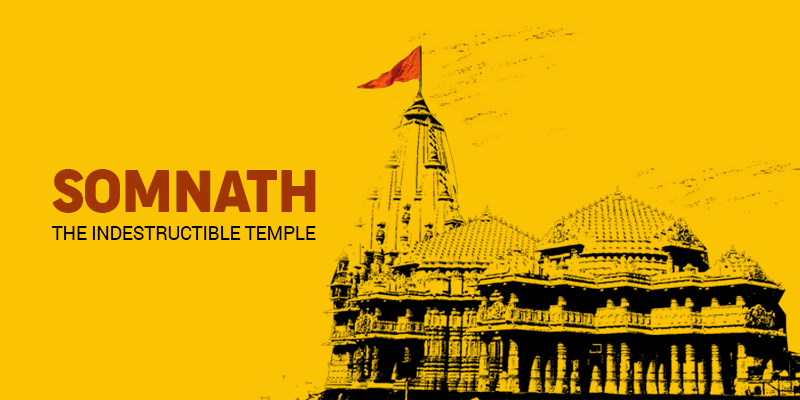 There is an interesting mythological tale associated with Somnath Temple. It is believed that Moon God (who was cursed for favouring one of his wives) prayed to Lord Shiva at the exact site of the temple. Lord Shiva appeared before penancing Moon God and freed him from the curse. 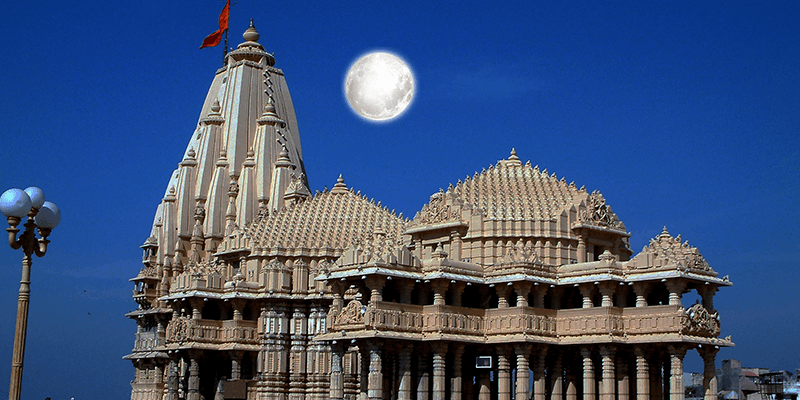 Moon regained his brightness and Somnath became a sacred shrine for the Shaivites. Another piece of legend states that the first temple of Somnath was built in gold by the Moon god (Soma), in silver by the Sun god (Ravi) and in wood by Lord Krishna. Trivia: Present idol of Shiva was installed by the first President of the independent India Dr. Rajendra Prasad on May 11, 1951. Restrictions: Cell phones, cameras and electronic gadgets are not allowed inside the temple. As per Puranic accounts, shortly after the death of his elder brother (Balarama), Lord Krishna retired into the forest to meditate. While sitting under a tree, a hunter named Jara mistook his partly visible foot as a deer. He shot an arrow which mortally wounded Lord Krishna. Bhalka Tirtha is situated on the exact place where Lord Krishna was struck by an arrow and left the mortal world. The tree under which he was sitting, passes through the roof of this temple. 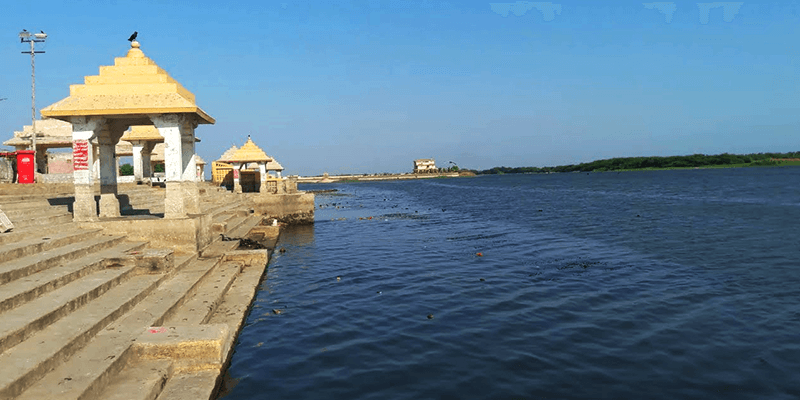 Triveni Sangam is the confluence of three sacred rivers – Hiran, Kapila and Saraswati. This is the exact site where these three Indian rivers meet the mighty Arabian Sea. The Laxminarayan and Gita Temple are located on the shores of Triveni Sangam. It is also believed that Lord Krishna was cremated on the shores of this place. This is the temple of the Moon God, Soma. As mentioned earlier, the Moon God performed a Yagna to free himself from his sins here in the city of Somnath. As a tribute to the Moon God, the temple was erected by the ancient priest of the Somnath temple – Shri Bhav Brihaspati. It is one of the rare temples where the Moon God is worshipped. 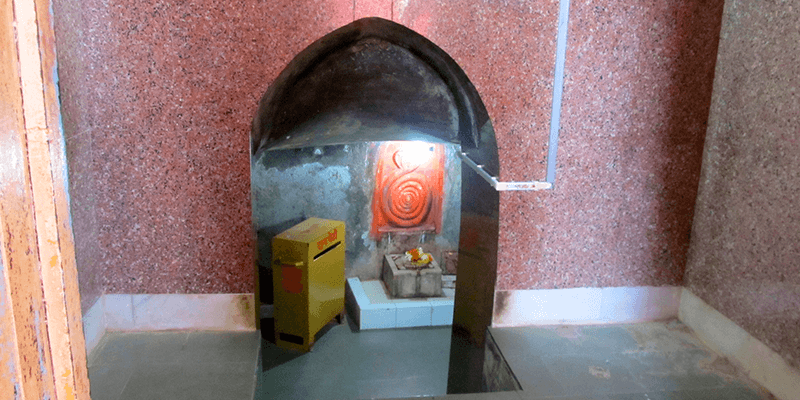 According to a legend Baldev (aka Balarama), who was Lord Krishna’s elder brother, disappeared through this cave into the netherworld and he was reincarnated as Sheshnag (the king of snakes). 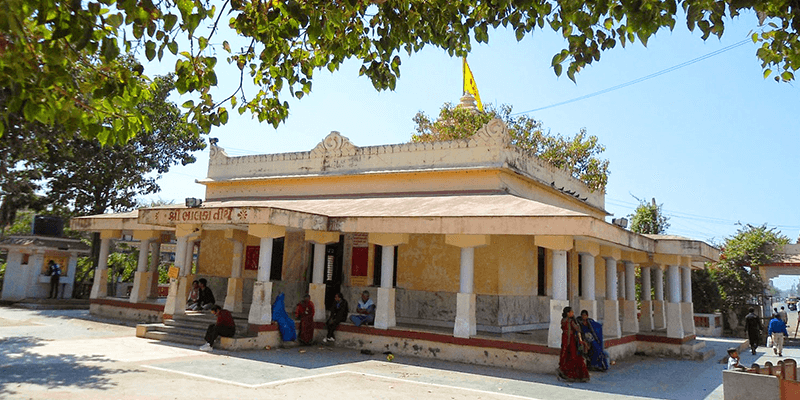 Baldev Gufa is situated 4 KM away from the Somnath temple and under government patronage, the cave temple has become an important Somnath sightseeing attraction. Somnath Prabhas Patan Museum houses many unique artefacts from ancient India such as toranas, pillars, stone apsaras, statues of Lord Agni, Uma Maheshwara, Lord Vishnu, Parwati and Natra Bhairava. There is also a very special section within the Patan Museum where the waters of many revered rivers are kept. In this section of the museum you can find the Holy waters of Nile, St Lawrence, Danube, Tigris and Murray. Next articleSuper fun adventure activities to keep you busy this summer. This blog on Somnath is too good, and really covers all the related things in Somnath. As I belong to the place I suggest you to add two more places to your travel itinerary: Veneshwar temple (near Somnnath temple) and Shiv linga (situated almost in the sea).